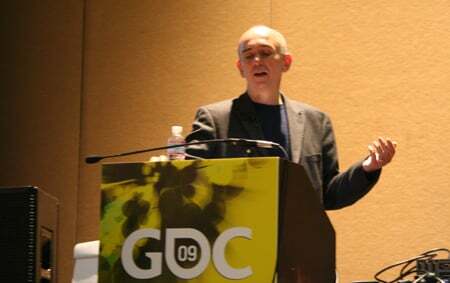 GDC 09 Acclaimed inventive game designer Peter Molyneux was thisclose to dropping the name of his next project at his Game Developers Conference lecture today. Alas, the man caught himself mid-sentence while referring to Lionhead Studio's newest project, holding his head and exclaiming "that would have been a nightmare." The sizable crowd attending to hear one of the gaming world's best known gurus of innovation was obviously a bit saddened to have an anticipated morsel snatched away so quickly — but the ensuing Q&A did turn up an interesting conundrum for a studio that thrives on innovation. Traditionally, most of Lionhead's best gaming experiments occur after a project is finished, Molyneux said. But with the new popularity (and expectation) of downloadable content, when does a developer have time to mess try something really out there? "More and more we're finding that lovely summer holiday at the end of a project is getting less and less," Molyneux said. The theme of his Friday afternoon chat was a tour of Lionhead's gaming experiments. Molyneux said his studio regularly deploys teams of 1-5 people to dabble in new gameplay or technical experiments that usually last between 1-12 weeks. While much of the testing falls flat and never is seen in an actual game, a few gems like the dog companion in Fable 2 (Molyneux said he came up with that one himself) becomes a major part of a title. Others, like the weather mechanic in Black & White (another Molyneux inspiration) turn out to be "just a dumb and stupid idea" that can de-rail the game's creation for a while. "But that doesn't mean we shouldn't do it," he said. "If I was a betting man, I'd bet on that what our customers really want is that innovation. They want to be shocked and surprised every time they spend that untold fortune on video games." Besides, he added, if you don't foster innovation the creative people will leave to start their own studios. Experimenting can save time and money for game makers too. For instance, Molyneux originally dreamed being able to punish or reward the dog companion in Fable 2 by patting or scolding. Not only did testing reveal players spent their time prodding the canine's bum, but they found it didn't necessarily help in their goal of bonding with the animal. "If it hadn't been for [testing], we would have waited probably a year to come up with that conclusion." 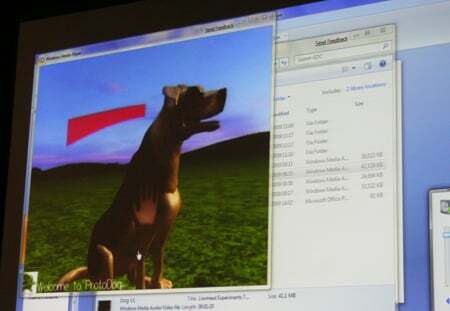 Among the concepts Molyneux showed off was a good hint of a future project. We're entering speculationville here — but he mentioned working on a technology that will help create "thousands and thousands of animations in creatures" at once. He mentioned the tech was dreamed up too late for Fable 2 , but "may be used in a future game, 'who knows?'" 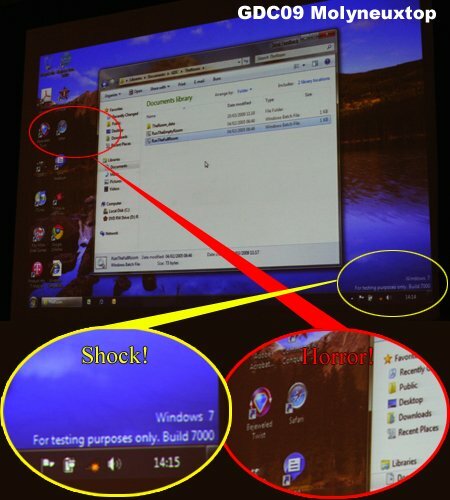 This reporter was shocked and awed to find as Molyneux loaded his presentation to see not only was the man (tempting fate by) using a Windows 7 beta to run his demos — but he apparently browses with Safari on a Windows machine! Truly this is a man sacrificing for his science!